Open-plan living has risen in popularity in recent years. We’re seeing it in many new, modern developments as well as in conversions of period properties. Whilst traditional homes were designed with separate rooms, each of which had its own specific function, the move toward open-plan space is more in tune with the way most people live in contemporary society, particularly families. The kitchen tends to be the central hub where everyone gathers and interacts, so it makes sense to incorporate the main dining and living areas into this space. Formal dining rooms and sitting rooms are not as practical as they once where because they no longer meet our modern social needs. So whether you’re planning to buy a new home with an open floor plan, or you are thinking about renovating an older property, here are some pros and cons of open-plan living to consider. 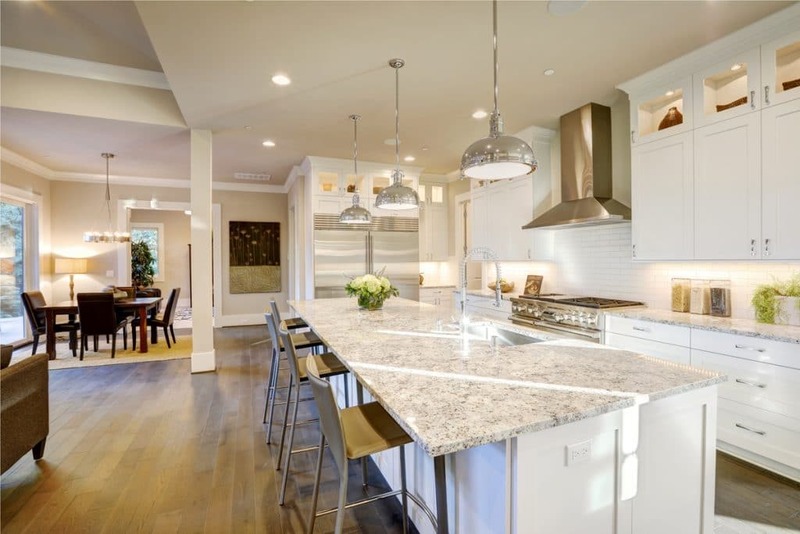 When designed well, an open floor plan has a natural flow that encourages us to connect and interact more effectively in the home. This type of communal living space is multi-functional and facilitates togetherness, which are so important for today’s busy families. Whilst the adults prepare dinner, concentrate on housework, or socialise with friends in a communal living area, the kids can play or do their homework under supervision in the same safe space. This is a huge benefit if you have small children and/or you work from home. The elimination of dividing walls opens up interior space, making small spaces seem larger and allowing fresh air and natural light to enter more areas of the home. This can have a remarkable impact on small properties in particular, and homes that cannot accommodate a separate dining kitchen. With property prices rising by the day, it’s a great way to get more space for your money or increase the value of your East Renfrewshire property. It can be costly to knock down interior walls in older properties, particularly load-bearing walls. Heating large, open-plan areas can also prove more expensive because you’re using all of the space all of the time. Energy efficient heating and good insulation can reduce these costs significantly. Open floor plans can be very active and noise, and there’s also the lack of privacy to consider. It’s important to think about whether or not these factors could have a negative impact on your needs and preferred lifestyle. For most families, however, this type of social interaction is what it’s all about! Cooking smells, dishes and recycling can be an issue for some people when it comes to open-plan living. This is one of the biggest factors to consider, but you can easily avoid such issues by ensuring you have good ventilation, a dishwasher and perhaps a well-organised utility area where dishes and other such things can be placed or stored out of view. There’s a solution to every potential problem! Open plan living or separate rooms? We all have our personal preferences when it come to our homes. Some people will always favour a more traditional interior layout with separate rooms, whilst others will be drawn toward the social and practical benefits that open-plan living has to offer. It simply depends on what works best for your lifestyle and needs, as they exist now and as they evolve and change in the future.